Mike Ferris my colleague at Red Hat in the US posted an article a few weeks back that I should have shared with you. Mike and I have worked extensively together, before I was the evangelist here in the Cloud Business Unit I worked alongside him identifying and building out Public Cloud providers using Red Hat Stack technologies in the US and across EMEA. Mike "gets" the whole ecosystem of Cloud from a hard-won and well earnt position in the enterprise pantheon. For a decade within Red Hat he's seen us emerge from the initial steps around the release of RHEL as a subscription based service (and been a key player in that emergence), to understanding and rewriting the rule book around the value add piece. So his thoughts and relevance are current and with earnest foundation. He's someone you should listen to. Looking at the whole ISV model and the scalability of architecture Mike asks the three key questions that ISV's should take into consideration when contemplating that move to Cloud. You can read the article online here at Mike's Cloud blog. Posted in News on July 31, 2012 by dickmorrell. I drove the 200+ mile round trip yesterday to our Farnborough offices for some meetings and to finalise a Cloud Security Webinar that we are doing globally tomorrow (read more about this later). Whilst there I met up with Jeremy Brown one of the shining lights of Red Hat EMEA. I have been really eager to get a microphone in front of him for weeks so this was an ideal opportunity to record a podcast. Jeremy will be talking about JBoss, OpenShift and the cool things that we're working on in the UK as well as the latest and greatest releases from the JBoss release team. The challenges enterprises and corporates face and also everything PaaS. To click through to the links we're going to be talking about in the PodCast you can access OpenShift's portal here and learn more and sign up for a free account and get running right now ! Posted in Cloud Software, PaaS, SOA. Tags: AS7, cloud, EAP, JBoss, Jeremy Brown, OpenJRE, openshift, paas, php, podcast, Python, Ruby on July 31, 2012 by dickmorrell. On Wednesday evening this week a healthy sized group of us attended the first OpenStack London Community Meetup held at the Blue Fin buildings in London organised by Canonical’s Mark Baker. I was registered to attend along with other Red Hatters Daniel P Berrange, Adrian Bradshaw and Steven Harvey as well as future Red Hatter Peter Robinson who joins our ranks in a couple of weeks time and who was out at Summit with me. The original plan was to travel up to Baker Street in London to our London office and record a podcast on Libvirt with Daniel and then travel to the meetup in the evening to listen to the talks, Daniel giving one of the keynotes on Node, Libvirt and all the goodness that flows from it. We decided actually we do this better justice than to just do a podcast and instead record his presentation and talk for a wider audience than the 80-100 in the room and give it more exposure as it’s very cool stuff. So hastily I rigged microphones and recording gear and the result is this podcast release. Posted in Cloud Software, Community, IaaS, News, PaaS, SOA. 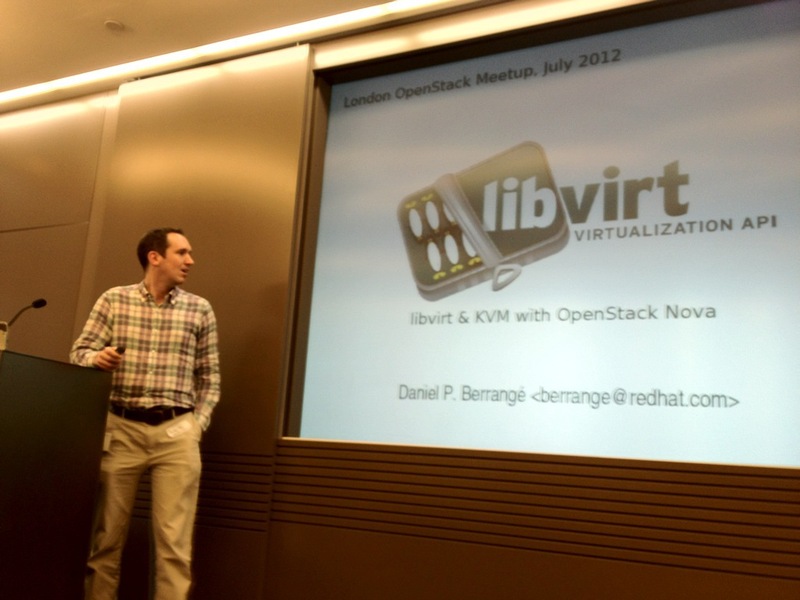 Tags: Daniel P Berrange, OpenStack, podcast, redhat on July 27, 2012 by dickmorrell. Last month I wrote an article on here about how governments, firms, organisations and individuals looking to succeed in Cloud should look at focusing on skillsets and technologies from the Open Source community. It is becoming increasingly obvious I am just scratching the surface. After attending summit in Boston it is abundantly clear that Cloud is doing something evolutionary as well as disruptive but that is highlighting personal individual growth and causing an almost automatic promotion of people in development and architectural IT roles. I can only comment on what I see from the Open Source community but for those who involved in more proprietary areas of IT such as VMWare and Microsoft I would genuinely welcome your feedback in the comments box or offline if you would prefer. In a recent former role I was involved in the above classified architecture and accreditation of Unix and Linux platforms for the battlefield and for the deployed IT needs of UK and coalition forces in the arena. A lot of application hosting and a lot of natural secure segregation depending on the classification of the application or data being used in the field or the level of secrecy applied to it's usage. I'm obviously not going to breach The Official Secrets Act or confidentiality of a customer but let me explain the gulf of then and now. A lot of these applications were deployed in the most critical areas of IT operations you can think of. Deployed on hypervisors and with secured storage requirements and tied down with multiple layers of intrinsic mandatory security controls. You'd expect nothing less of mission critical platforms. However it taught me a lesson, it taught me that a lot of the applications were unweildy and built by legacy IT houses who made a very good living out of throwing an application over the fence and then relying on a network architecture guy to accept the risks and firewall / enforce policies to ensure compliance and that security was "somebody elses job" and not part of go to market "out the box". What it did mean was that I was dealing on a very regular basis with companies shipping catalogue based products for deployment in bare metal and virtual infrastructures. Security was a dirty word. It was the last tick in the box and we were a hurdle to climb over. Engaging with a lot of the application developers in the upstream feeder community of companies in the FISMA/FIPS space is always painful because security conformance to them is often waving an outdated Target of Evaluation (ToE) or Common Criteria certificate that means nothing to a deployed environment and simply represents a tick in a procurement checkbox. When asked about variances around deploying in physical, or virtual hypervisor based environments there was never really differentiation and guidance forthcoming. This is sadly the norm for most major software companies especially in the middleware and the proprietary development environments. So it's no real surprise now that the ever increasing amount of organisations and institutions who are weaning themselves away from those supplier organisations and working with their own development staff. Development staff who can help the company own the roadmap and lifecycle of application development management but also who can own the costings, the ambition and the growth of applications that reflect and often underwrite where that company is going. Can you afford to not look at more open ways of getting to Cloud ? Proprietary vendors if you also want to stay relevant and keep generating revenue you also have an opportunity to play a new game. I am attending the London OpenStack meetup tonight. Before that I am doing a podcast interview with Daniel Berrange of our Virtualisation Engineering Team who is talking LibVirt and goodness at the meetup. Want to talk to him about everything LibVirt, LXC security and CGroups and a lot of cool stuff. If you're around register and come and say hi. Would be good to see you. Posted in News on July 25, 2012 by dickmorrell.